From the land of 1001 Nights comes one night that can’t be missed. It’s the night of Nowruz, also known as the Persian New Year! Famous in the West for their cuisine and elegant rugs, the Persians use their New Years festival to prove to the world that they also know how to cut a rug. Elaborate celebrations and festivals abound, in Persia and in Persian communities around the world. There are concerts, celebrations, and fine cuisine; thankfully, you don’t have to be a sword swallower to enjoy Persian food. 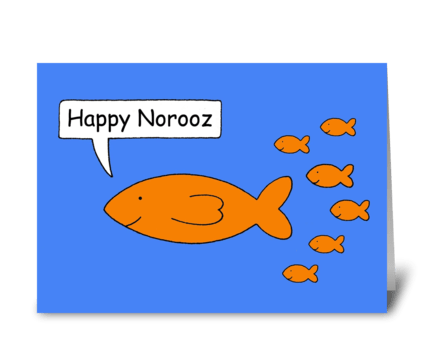 But it’s also fairly common to take this time to stay in touch with friends and family, Nowruz greeting cards are often sent wishing a happy night of celebration. And the best part about a greeting card for Persian New Year is that you don’t have to deal with the time change for family on the other side of the world. The Persian New Year is calculated to take place during the spring equinox, but since it’s calculated by the Persian calendar, it can take place on between March 20 and March 22. Traditionally the New Year has been a time for cleaning; Persians actually refer to their tenacious tidying as “shaking the house”, though that could also come from the fact that Persia is prone to periodic earthquakes. Tradition also dictates that the time after the New Year should be reserved for a twelve day long visit with family, followed by a picnic. But some of the most rowdy celebrations for Persian New Years are actually held by the Kurds, who celebrate by lighting a large fire and jumping over it – this tradition became a lot more practical after the invention of the fire extinguisher. But no matter how you celebrate it, Persian New Year is a great time to keep in touch with friends and family. By sending a greeting or a card, you can help ensure that the New Year will be good for you and your family. Don’t forget to wish them luck in hopping over the fire!